Fully In premise solutions make maximum sense for enterprises only if they can afford to maintain a reliable private data center (resources, operations man power, infrastructure – power, cooling, spares, compute, storage, network and OS/App licenses) to ensure maximum uptime on all fronts. This is true for any applications and more so for collaboration and communication apps since they are most frequently used to enable teamwork. Add to that, if the mail exchanger (MX) server is located at the in premise data center, the need for maintianing a high uptime becomes even more critical to reduce chances of mail delays and possible mail loss on the inbound path. Additional investments and planning is also required to setup a DR site and backup systems. Considering all this and more, while we feel that for SMEs, using Cloud Based collaboration services is the default way forward, its possible that you are unable to shift to an 100% cloud hosting model for various reasons. In such a situation, you may want to consider hybrid solution , that allows you the flexibility and privacy of maintaining an in premise setup and adds on the benefits of shifting a part of your critical workload to the cloud. 99.9% uptime: The Cruise solution (hybrid) hoists the Mail exchanger and mail cleaning work load onto the cloud. This adds a very high level of reliability to this critical function, which “should be always on” since mail is always flowing in from the external world. Mini DR site: Additionally, the cloud platform can store inbound mail in respective mailboxes on the cloud itself for a defined period so that the user has an option to login to the cloud account and access these new mail in case of any disaster or temporary loss of access to the in premise server. 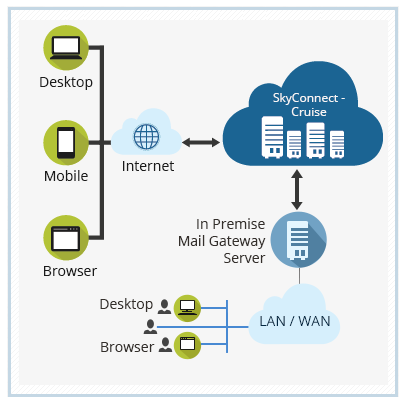 Secure Mail Flow: To top it all, the Cruise solution will also provide you with a Secure Mail Flow (a mail cleaning service on the cloud) to detect and quarantine spam and virus infected mail. Considering that most of the mail traffic is junk, this will free up immense amount of compute and network bandwidth (since only clean mail will make their way in) on the in premise infrastructure. Optimized local mail flow: You maintain your in premise server, so that the mail traffic amongst users on the LAN/WAN stays local within the server, which reduces load on the Internet Bandwidth and also speeds up the mail flow amongst the local users. In most organisations, local mail flow accounts for the bulk of the mail traffic. – Its a fully managed service that involves cost in terms of compute, storage and network infrastructure, man power resources and a NOC for maintenance and monitoring. – The solution comes bundled with SecureMailflow, a mail cleaning service based on one of the top International security solutions. – Get access to a mini DR site, that can be used to retrieve inbound mail of the last ‘n’ days and also send mail out in case of an outage on the in premise site/server. Our research and experience with customers has shown that you get a better overall ROI by choosing a hybrid over a fully in premise solution.